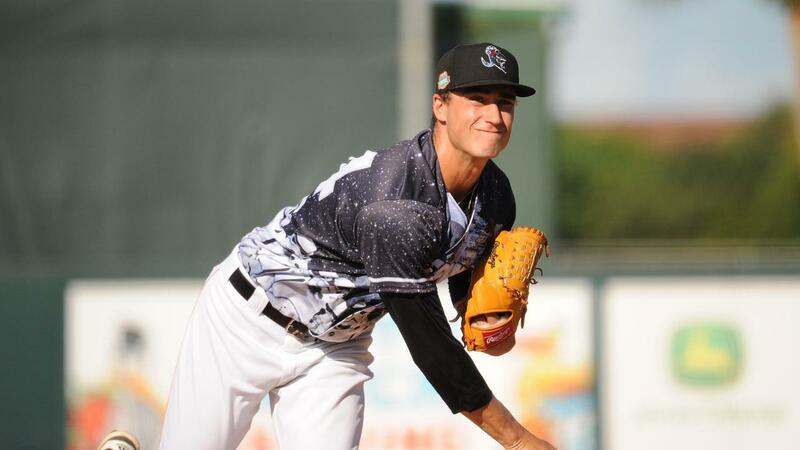 Another night of impressive pitching, this time by right-hander Jordan Holloway, lead the Jupiter Hammerheads to their fifth win of the season with a 7-2 victory against the Lakeland Flying Tigers Saturday Night. In his second start of the season Holloway allowed no runs and just one hit and one walk. During his six innings on the mound, the 22-year-old struck out eight batters on his way to earning the win. While Holloway was on the mound, Jupiter established a strong lead early on. In the bottom of the third, Riley Mahan batted in Jose Devers and Victor Victor Mesa with a line drive single to right. A 3-run homer from Isael Soto made it a 5-0 game. While Jupiter pitching continued shutting down the Lakeland, Hammerhead batters boosted their lead by adding two runs in the seventh. The Flying Tigers tested Lukas Schiraldi in the top of the ninth and earned two runs, but it wasn't enough and the game finished 7-2. Besides Holloway's dominating start, Tyler Stevens pitched two innings of relief without allowing anyone on base. Offensively, seven of the starting nine batters recorded hits on the night. Riley Mahan shined again, with three hits that included an RBI double. Jose Devers also made solid contact twice, going 2-4 with a double and a triple. The Hammerheads finish their series against the Flying Tigers tomorrow at 1:00pm at Roger Dean Chevrolet Stadium. For tickets, visit RogerDeanChevroletStadium.com or call 561-775-1818. Photo Credit: Ryan Dowd / Blue Leprechaun Photography This story was not subject to the approval of the National Association of Professional Baseball Leagues or its clubs.